Accessories range from awesome to ridiculous. One firearm’s accessory that’s been around since the 1930s is the bipod…which is the ultimate tool in stabilizing a rifle. While innovation is great there is typically a very simple way to tell if a concept is valid. Bipods have been around for so long and used on so many weapons because they work. Well, they work when they are used properly. A lot of shooters think they know how to use a bipod, and maybe quickly find that maybe it’s not as easy as sticking it on the ground. Today we are going to show you the basics of getting down and getting behind a bipod. I learned how to use a bipod not on a rifle, but on a machine gun. My time as a Marine put me behind quite a few weapons, but my main one was the M240 machine gun. Using a bipod wasn’t a convenience, but an absolute necessity when you climbed behind something belt fed. Before we ever hit the range with our bipod equipped rifle we need to ensure one simple thing is done. If you fail to complete this step correctly your trip to the range is going to be a loud means of wasting ammo and time. So what’s the most important step in shooting with a bipod? But… in my experience the majority of issues shooters rocking quality bipods have involved improper installation. This could be a bipod mounted way too far rearwards on a Picatinny rail or mounted backward. Sometimes they simply are tightened down enough. Even the smallest mistake can make shooting with a bipod difficult, so it’s critical you install a bipod properly. Follow the instructions included with your bipod and always ensure it’s on nice and tight. Rail or Sling Swivel Mount? Generally, there are two respected types of bipods. One attaches to Picatinny rails, and the other attaches to sling swivel studs. Both are secure and stable platforms for a bipod, and sling swivel studs seem to be the most dominant option out there. One isn’t better than the other, and there are often different adapters to allow you to use different bipods with different setups. If you are rocking the latest M-LOK rail, and want to use a sling swivel bipod there are options for that. There are options for Picatinny rails, and KeyMod too. If you are rocking a rifle with no rails and a sling swivel, and want a Picatinny mounted bipod there are always options to turn your sling swivel into a pic rail. We happen to live in the Golden age of firearms accessories so almost anything is possible. In fact, companies like FAB defense have come out with some rather, odd, but fascinating bipod systems for the Tavor and AR-15 platform. The sky is nearly the limit if you start bipod shopping. Regardless of the option, you choose you do need to consider the installation of the adapter as well. Make sure it’s installed properly and tight. You don’t want slack or give. 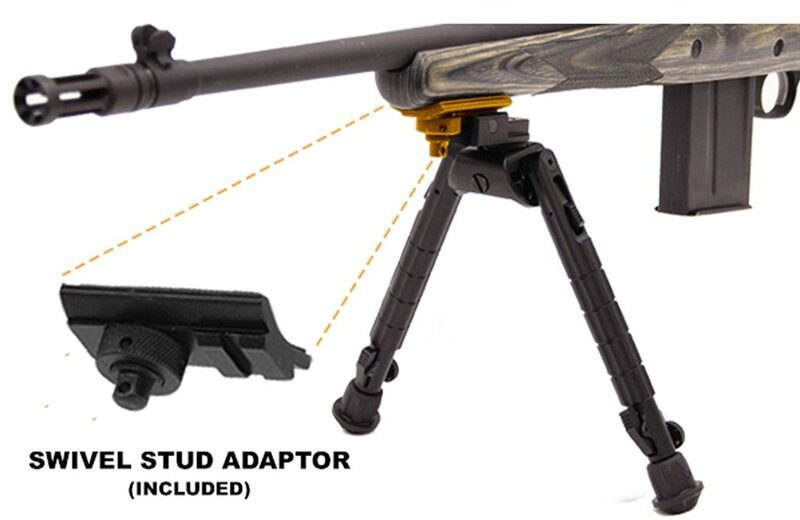 Slack in the adapter translates to slack in the bipod, which translates to slack in your shooting. Another important factor to consider is choosing where you set up with your bipod. I’ll admit I learned this purely through gunning with an M240 during my Marine Corps days. A hard surface is not a stable surface! It makes the gun rock and roll, twist, hop and generally makes any kind of rapid follow up shot a pain. Stay away from hard surfaces even though they seem so inviting. Look for softer dirt that the bipod can actually dig into. There was plenty of times I used my knife to dig through hard dirt to have a stable platform for my machine gun. There’s no reason you don’t take that same tactic and apply it to your bipod. Dig the fella a little trench to call home and you’ll give him a much more stable place to stay. You load rifles not bipods right? No actually to get the best performance out of your bipod and rifle both should be loaded. Loading a bipod is a little different than loading a rifle though. When you load a bipod you are putting slight pressure on it, which aids in stability. You are taking the slack out of the accessory that connects your rifle to the ground. The reason being is that a bipod isn’t going to do much to help deal with recoil. Recoil mitigation is still on the shooter. The lack of loading is what leads to the bipod and rifle moving rather erratically while shooting. Without any pressure behind the bipod, it’s going to basically act as a pivot. The recoil will cause it to hop up, or to one side. Bipods aren’t rabbits…Don’t let them hop. Loading a bipod is going to become even more important if you start doing any form of urban, or action shooting. Shooting from flat ground is one thing, but once you start adding in angles and odd positions and angles you’ll have to really control that rifle. How Do I Load My Bipod? Loading a bipod simply means apply some pressure to it via your firing shoulder. The trick is to learn the difference between too much, and not enough. Too much and you are going to shoving your bipod forward. I mean if you are physically moving the rifle and bipod across the ground you need to let up, take a deep breath and apply a little a finesse. Certainly, some weapons take more force than others, but if it’s moving you ain’t grooving. 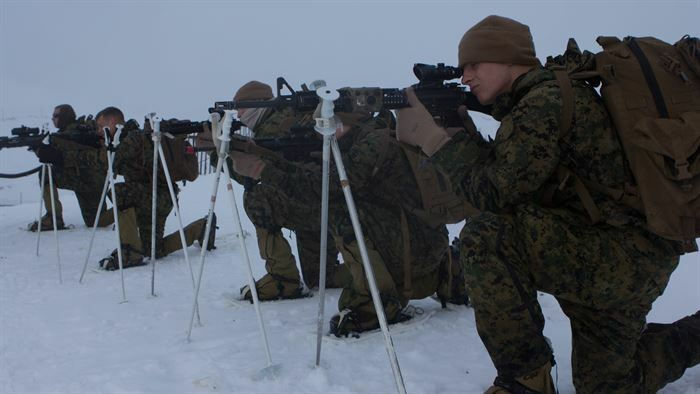 If the rifle is still jumping, and sliding backward you aren’t applying enough pressure. You need to put some more shoulder into it. You control the rifle, the rifle doesn’t control you. It’s a bit like a bully, you gotta let ‘em know early who the boss is. There are two methods you could use to load a bipod, the Toes method, and the Cobra method. To be fair one sounds lame and one sounds awesome, but both are effective. The Toe method starts with you getting into the Perfect Prone Position. From here you’ll bring your rifle up to your shoulder and get the fundamentals down. What you want to do is straighten out your feet, and push your body forward with just your toes. If the rifle moves forward you are applying too much pressure. The Cobra method involves no actual Cobras. (I’m sorry to budding herpetologists.) I call it the Cobra method because it involves a modified Cobra position from Yoga. To get this right you want to lift your upper body off the ground just a bit and pull the rifle to your firing shoulder. 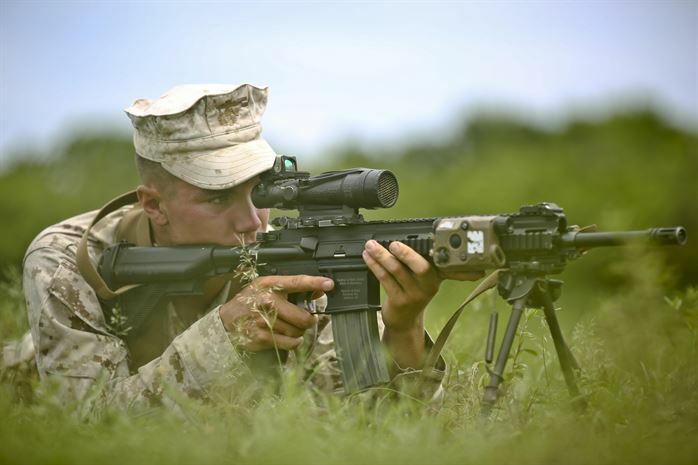 While keeping the rifle in place you want to lower yourself into that perfect prone firing position. Since you pulled the rifle back to you, and then stretched forwards the rifle is under some tension at the bipods, ensuring it’s set. 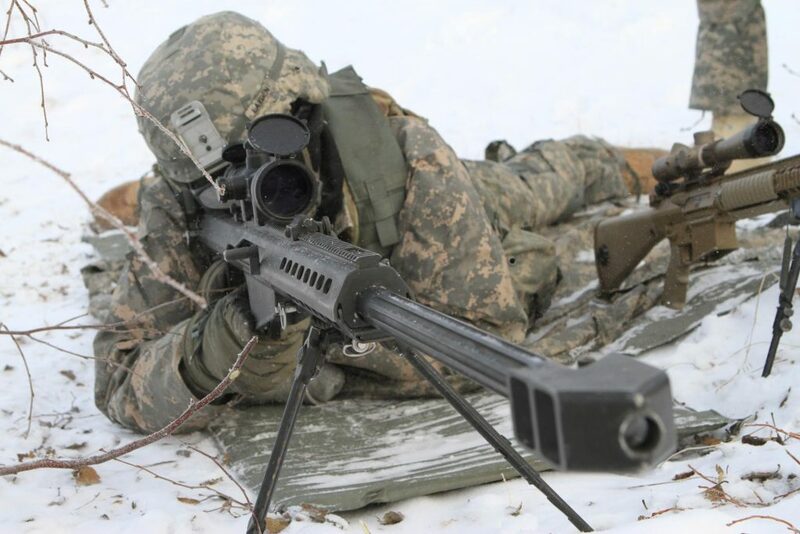 If you feel nervous or worried about setting your bipod don’t be. You may fail once or twice but it’s really easy to catch and correct. The bipods made by a company called Atlas are actually great if you are worried about loading. You can ‘feel’ the bipod become loaded with an Atlas bipod really easily. It’s kind of like the reset on a Glock, you can just feel it. One of the few things golf has in common with shooting (besides being expensive) is that follow through is critical. When shooting with a bipod you don’t get to eliminate follow through. For some reason the moment people get a bipod and a spotting scope out they forget about follow through. 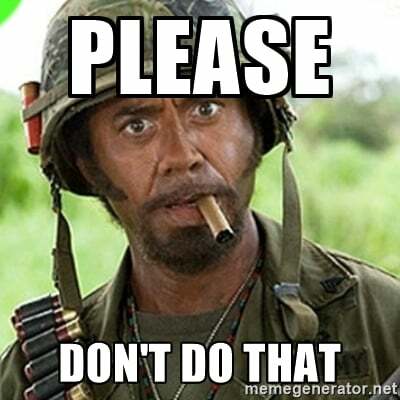 So many shooters take a shot and immediately drop the rifle and move to their spotting scope to try and see where they hit. They eliminate the idea of seeing where your sight picture is after the shot, which is critical with a bipod. Your sight picture should be reexamined after every shot. You want to ensure your sights are not moving drastically between shots. If you’re aiming at the bull’s eye and after you fire your sights land on the right corner of the target your bipod may be moving. You need to check your bipod’s load. Take your shot, and stay behind your gun, watch where your sights come to rest. Just be patient for a few more seconds. Here are a few options I like. UTG has really stepped up their quality control in the last few years and it shows. They are still a budget company, but you won’t find them in the junk drawer anymore. The UTG Heavy Duty bipod offers you 360 degrees worth of panning room. It extends from 6.69 inches to 9.12 inches, and each leg can adjust independently over 5 different positions. The UTG Heavy Duty will mount on either a Picatinny rail or a swivel stud kit. The UTG bipod can fold forward or rearward when not in use. For casual use, or even hunting it’s affordable and can mount to most rifles. The Accu-Shot is one of the higher end rifle bipods on the market, and the price reflects. The Atlas series of bipods are absolutely fantastic and some of the best of the market. They’re popular among precision shooters due to their tight tolerances and extreme reliability. They can extend from 4.75 inches to 9 inches and 15 degrees or panning and cant. This system will mount to any pic rail and locks on extremely tight and solid. 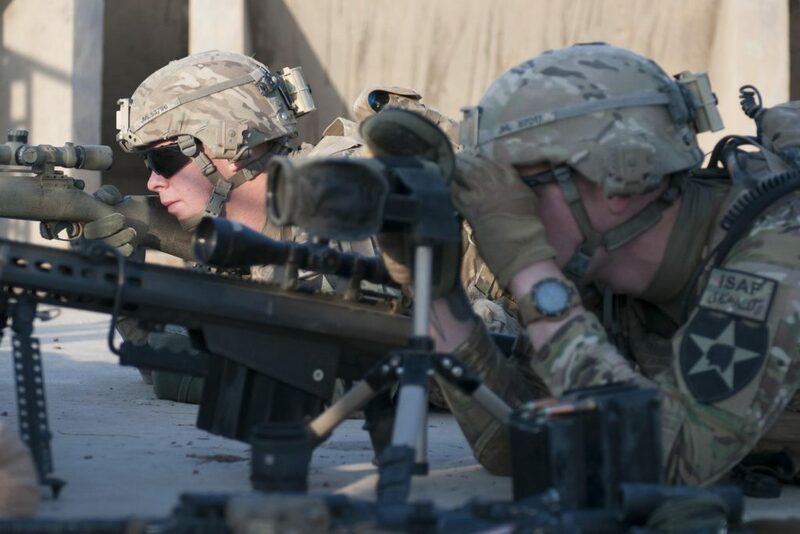 Harris bipods are the favorite of most military units. 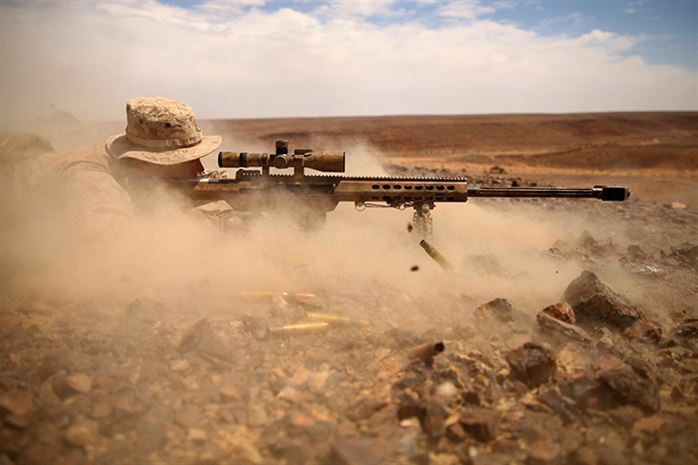 They are an off the shelf option for snipers and designated marksmen that’s lightweight, effective, and easy to use. The S-BRM series is likely their most popular bipod. The Harris extend from 6 to 9 inches in 1-inch increments. The legs are spring loaded for rapid deployment, and the system is perfect for an AR-15, or a bolt action rifle. Bipods are so simple and so ingenious. They work wonderfully to stabilize your gun and allow you to take some of that human error out of the process. Bipods are a must have for anyone looking to shoot in the prone extensively. 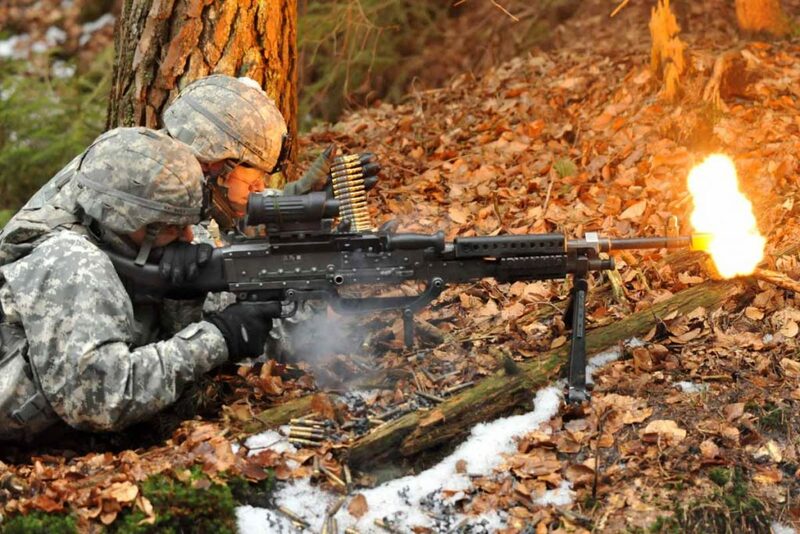 Any Bipod hints, tips, or suggestions from our readers? What’s your favorite Bipod? Link it below in the comments! Good info! Can you discuss pan and tilt a bit more though? For example, do you want a bipod that can lock it’s tilt or does it matter? I do like one with pan and tilt so you can load it up snugly. 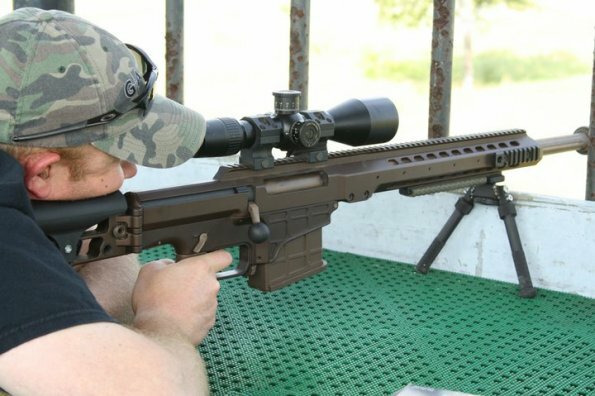 Great article., should be attached as instructions with every bipod purchase. I tried UTG years ago and considered them junk. Might have to give them another chance. Harris has always served me well. Well, I may not be handsome, but I do wake up in the mornings older and uglier. Older is okay; the uglier part I could do without. I just bet some. if not a lot, of your readers are not handsome; they are pretty if not beautiful. P. S. Thanks for the great articles. This is a nice piece of wisdom.